YES!!! One of the most important foods has its own day. July 30th is National Cheesecake Day! In honour of such a meaningful and absolutely justifiable occasion, I bring you some cheesecake history courtesy of cheesecake.com, their step-by-step guide to making one of the most popular cheesecakes (recipe included) and, of course, some mouth-watering recipes. 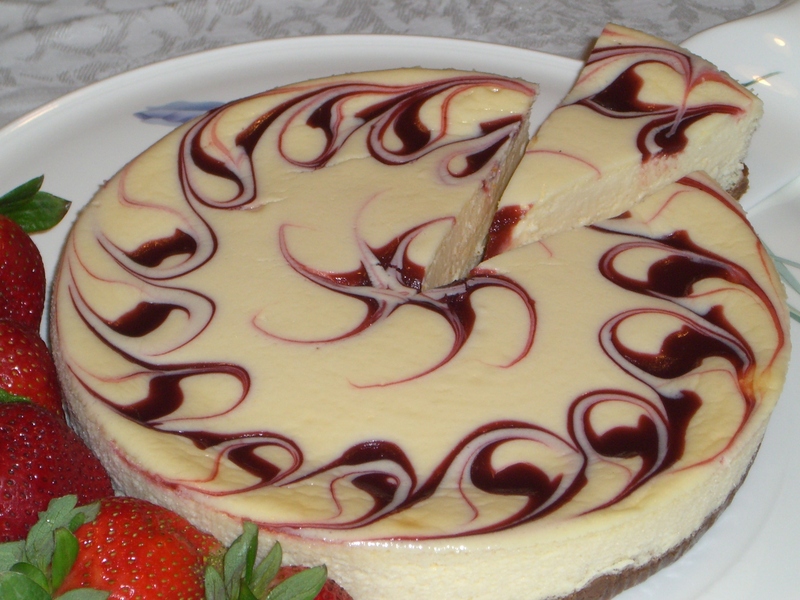 In Greece, cheesecake was considered to be a good source of energy. There is evidence that it was served to athletes during the first Olympic games in 776 B.C. When the Romans conquered Greece, the cheesecake recipe was just one spoil of war. As the Romans expanded their empire, the recipes started taking on different cultural shapes, using ingredients native to each region. Cheesecake.com also takes you step-by-step in making and baking a perfect cheesecake using a New York Style cheesecake recipe. And now, the best part, the recipes. These recipes are from allrecipes.com. If there isn’t something here that you like, they also have an article “Ten twists on one great cheesecake” where they give you a master cheesecake recipe that, with the addition of a couple ingredients, also make some cheesecakes such as Tiramisu, Chocolate Orange, and Lemon. Preheat oven to 325 degrees F (165 degrees C). Line a 9×13 inch baking dish with aluminum foil, extending the foil sheets over the side of the dish. To make the crust, mix the graham cracker crumbs, butter, and 2 tablespoons brown sugar together in a bowl until evenly blended. Press evenly over the bottom of the prepared baking dish. To make the filling, beat the cream cheese, 1 cup brown sugar, and vanilla together in a mixing bowl until evenly blended. Beat in the sour cream. On low speed, add the eggs, one at a time, just until blended. Pour the mixture over the crust. To make the topping, place the apples in a bowl, and toss with 1/2 cup brown sugar, pecans, and cinnamon until evenly blended. Bake in preheated oven until center is almost set, about 55 minutes. Cool, and refrigerate 4 hours, or overnight. Before cutting, allow the cheesecake to sit 30 minutes at room temperature, then lift from the baking dish using the extended aluminum foil sheets, and place on a cutting board or serving plate. Remove the aluminum foil, and cut into 16 squares. The 2011 Major League Baseball season has begun! If you’re able to get to a game and have anything (or perhaps everything) in the food pyramid, enjoy the game, food and atmosphere. If you’re not able to go to a game, here’s some recipes from Allrecipes.com to help you enjoy the experience at home. To start the festivities…the late Hall of Fame baseball announcer Harry Caray singing “Take Me Out to the Ballgame”. What is a ballgame without ballpark franks. This Chicago-Style Hot Dog recipe is based on the Chicago Dog which is always made with an all-beef frank and a poppyseed hot dog bun. Place hot dog in the steamed bun. Pile on the toppings in this order: yellow mustard, sweet green pickle relish, onion, tomato wedges, pickle spear, sport peppers, and celery salt. The tomatoes should be nestled between the hot dog and the top of the bun. Place the pickle between the hot dog and the bottom of the bun. Don’t even think about ketchup! Snack time always has time for some soft pretzels. Do you want an easy recipe for nachos? Here’s a three ingredient cheese dip recipe for Turkey Nachos. Combine soup and salsa in a saucepan or microwave-safe bowl. Stir in turkey; cook until heated through. Serve warm with tortilla chips. Here’s a quick popcorn recipe with pecans and almonds to snack on while watching the game. In a large bowl, combine popcorn and nuts; set aside. In a large saucepan, bring sugar, butter and corn syrup to a boil. Boil for 5 minutes, stirring occasionally. Remove from the heat; add vanilla, cream of tartar and baking soda. Drizzle over popcorn mixture; stir to coat. Immediately spread onto two greased baking sheets; let dry for about 1 hour. Store in an airtight container. One more baseball song for you. When I would be listening to the radio in February and hear the song Centerfield by John Fogerty, I knew spring and opening day were not too far away. My cabin fever would always start to melt away before the song was finished. When you’re sick the last thing you may feel like doing is thinking, never mind cooking. So, I looked for a couple of quick recipes you can do batch style and put in the freezer. Both recipes can be changed to suit your tastes and what you already have at home. I found this at Chatalaine.com, where you can find the directions and nutritional information for French Country Chicken Soup. The recipe is for a slow cooker but can easily be done on the stove. This recipe for Minestrone Soup is from Allrecipes.com. Again, the directions and nutritional information can be found at the link.